Not done in a studio, but outside amongst fire ants and mosquitoes! - Nikon D700 with Nikkor 70-300mm f/3.5-5.6 lens @ f/5.6 ISO 200 1/200th Strobist: Nikon SB-900 Speedlight @ 1/128th power on light stand to frame left triggered by Commander modeBarbie has started a new four DSLR Photography Lesson set with me. We picked up right where we left off on Monday with some flash portrait practice. However tonight, we got the flash off the camera for some strobist style shots. Can you guess where the above shot was taken? Looks like a studio right? Actually, it was right in Vinoy Park around sunset time. Such is the power of off camera flash combined with the right lens and exposure settings. Almost anywhere can be made to look like you are working in a studio. 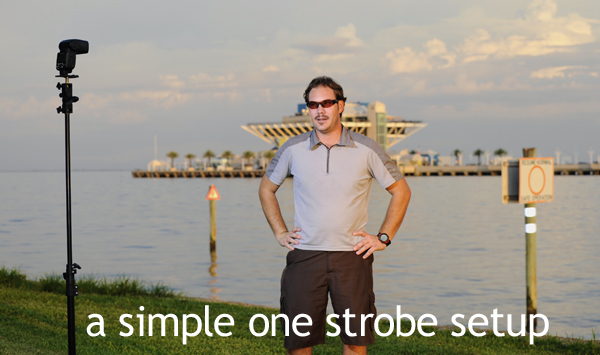 learn how to make an anywhere headshot with a 1-on-1 DSLR Photography Lesson with Jason today! For the above shot I used Barbie's kit (Nikon D700, Nikon SB-900 Speedlight bare, Nikkor 70-300mm f/3.5-5.6 lens) combined with my light stand. The background, if it were in focus, is Tampa Bay at dusk. This was my second time getting hands on with Barbie's SB-900 and all I can say is: it is VERY powerful. Most of the time tonight it needed to be manually set to 1/128th so as to not over expose either myself or her. As you can see, our setup for tonight's lesson was as simple as strobist photography gets, just a single strobe on a light stand, with not even a diffuser cap on the flash. The SB-900 was triggered by commander mode on Barbie's D700. All Nikon's D80 and above (D90, D300, D300s, D700) have this mode that uses the DSLR's built-in flash to trigger the Nikon strobe (SB-600, SB-800, SB-700, SB-900). Now, this is a great feature to have standard in the camera, but it is not totally reliable as a line of sight is needed, so for proper strobist photographer I do recommend getting radio triggers.